‘Super-mom’ delivers miracle baby in the passenger seat – moments before she gets to the hospital! 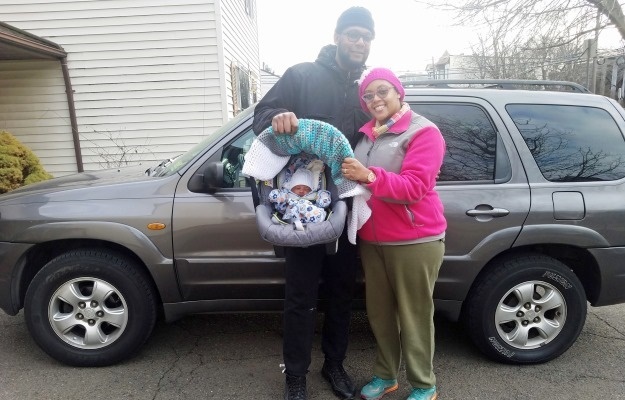 A mom has delivered her own “miracle baby” in the passenger seat with her children in the back, after her husband thought she was exaggerating. Evonna Byrd (28) from Newark, New Jersey, was lucky not to bleed to death while delivering her son Ezra in their family’s SUV en-route to the hospital. Her water broke just three minutes into the 15-minute drive and less than a minute after her water broke she noticed the baby’s head sticking out. Husband Chris (30) dismissed the claim as an exaggeration – but had to eat his words when moments later the baby’s shoulders started to appear. Moments after trying to readjust him, she had given birth to Ezra in a pair of baggy sweatpants. They were just 10 minutes from the hospital. Evonna, a home-school mom and founder of a non-profit mentoring program for young girls, said it was truly a miracle. She says she was in a lot of pain while they were in the car. “I felt excruciating pain. It was the worst pain I ever felt in my life. I felt like I was dying. I couldn’t believe what was happening. She says she was telling Chris that she couldn’t hold on any longer when all of a sudden her son’s head popped out. Evonna’s two older children, Crystal (3) and Christopher Jr (1), were sitting in the back seat at the time of the birth. Christopher Jr was too young to comprehend what was happening but Crystal understood that her mom was pregnant and that something was wrong. Once they arrived at the hospital, medical staff had to come out to the car to cut the umbilical cord before bringing Evonna and Ezra in on a stretcher. Evonna was surprised with how well the birth went, considering the horrific experience in the car. In addition, she and her family felt like “little celebrities” all over the hospital. The family say Ezra has been feeding well and is adapting to his siblings, completely unaware of his unique birth story.